I hope you all had a great weekend and a great start to your week. 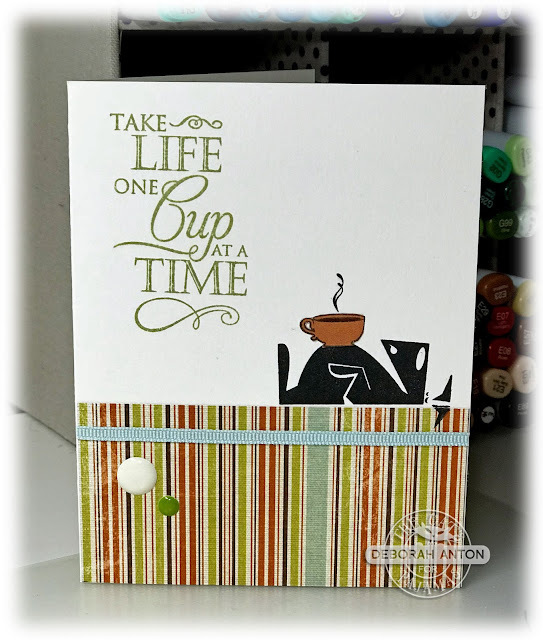 It's time for another TCPTUES and this challenge is all about my favorite - Coffee or Tea!! There are so many wonderful, cute, and funny sets in the TCP Store perfect for this challenge. I went through my stash of TCP stamps and had a hard time choosing which ones I wanted to use. I settled on using the set of Big Cups and it always makes me giggle. This image reminds me of how I feel at about 3:00 of every day. I just need to lie down with a cup o' joe. :) Of course, I had to use it. Some patterned paper was placed at the bottom of the card so the image could be stamped along the top. I made sure his cute little ear hung over the paper and paper pieced the cup with the coordinating color to this patterned paper. The sentiment was stamped at the top with some Pistachio Memento ink and the card finished with some fun enamel drops and ribbon. We hope you come play along with the challenge and link your creation up on the TCP Blog for your chance to win! Thanks for popping in and taking a peek!! Have a great week! Don't you wish you could be greeted every morning with a cuppa brought right to you? Very cute Deborah.